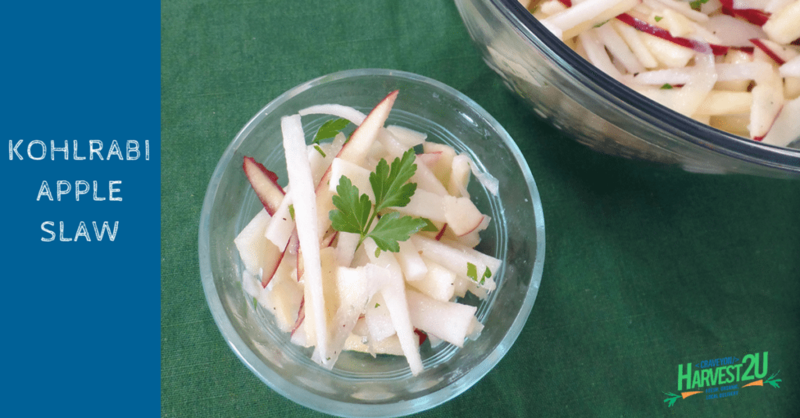 This Kohlrabi Apple Slaw is a simple and healthy side dish. Especially relevant is, kohlrabi is a good source of Thiamin, Folate, Magnesium and Phosphorus. And its also a very good source of Dietary Fiber, Vitamin C, Vitamin B6, Potassium, Copper, and Manganese. Pair it with sweet apples (such as red delicious, gala, or honey crisp). This is a nice alternative to traditional cole slaw. To begin with, peel your lovely organic kohlrabi and cut into matchstick size pieces. Next, cut apple into matchstick-size pieces (leave the peel on for color if desired). Then, toss kohlrabi, apple, cilantro, olive oil and lemon juice together and season with salt and pepper. The renowned chef Audrey Humaciu created this recipe for Harvest2U. Audrey is the Editor in Chef at That Recipe and VP of Creativity and Sarcasm at Munofore. When she’s not blogging about her eclectic interests from cooking and crafting to ornamental horticulture and the idiosyncrasies of the American language, she’s just your typical 40 something mom livin’ the life in the California burbs… without the minivan and over priced coffee.